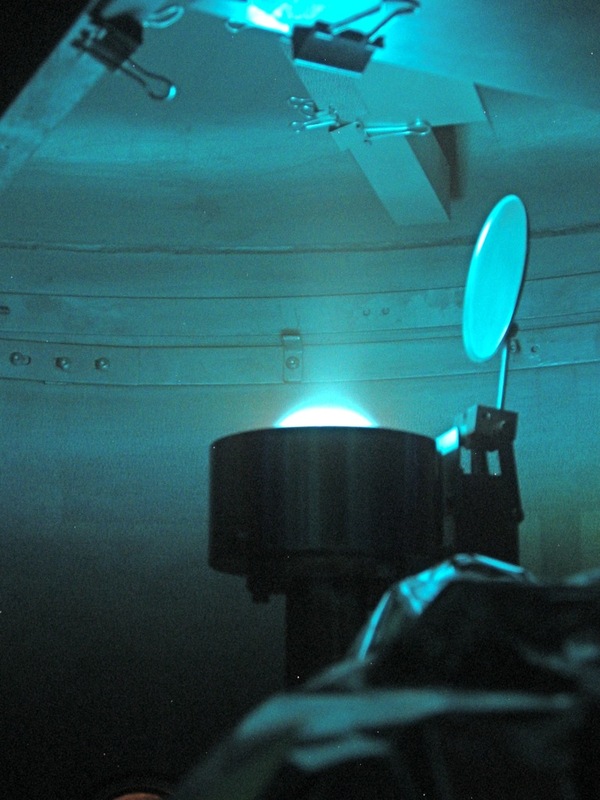 Sputtering is a process where the surface of a material ("the target") is hit with energetic ions in a plasma; the ions knock individual atoms/molecules out of the surface of the target. This is comparable to evaporation, but the sputtered atoms have higher energy as they come off, and the target does not have to be heated to high temperature. 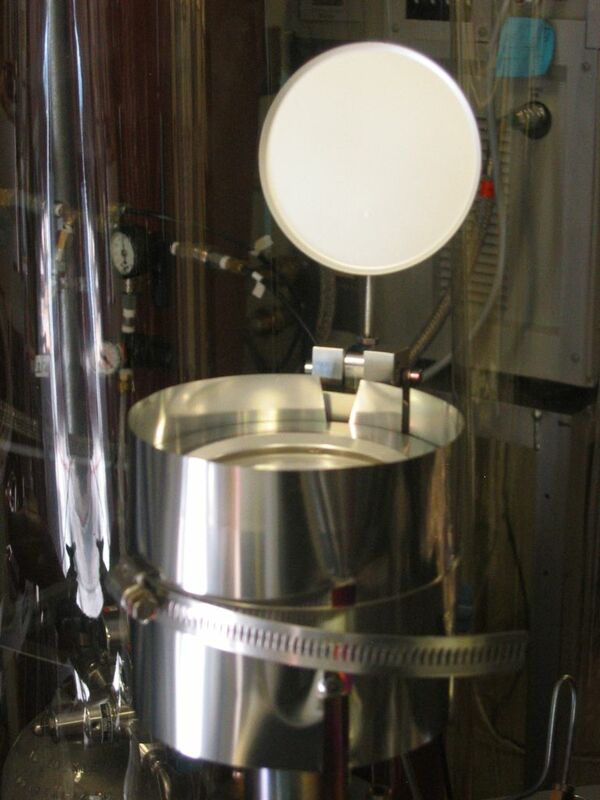 Sputtering has the advantage that deposited atoms hit the substrate with higher energy, allowing them to move and settle into a good film structure. The magnetron is a device that creates and traps a plasma in magnetic fields near the inventory. Magnetrons come in a variety of forms (circular, rectangular and cylindrical) and sizes. Ours are relatively small, 3-inch circular magnetrons manufactured by Materials Science, Inc. (MSI). 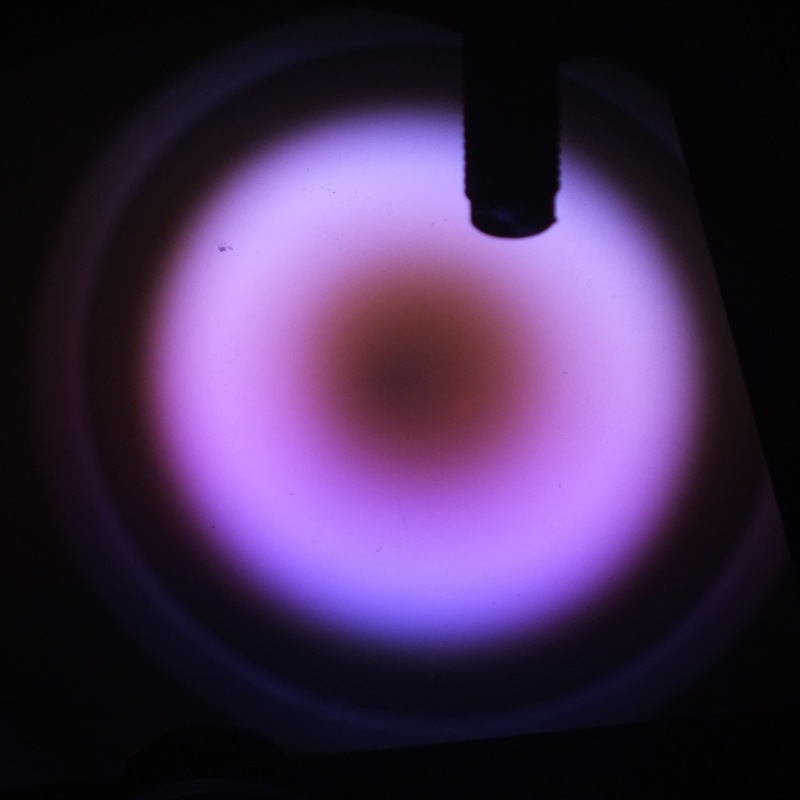 A magnetron has only one target, so to sputter two materials during a coating run, two magnetrons are required. We usually use Argon as the carrier gas for the plasma. (left) Magnetron depositing silver on glass slides. 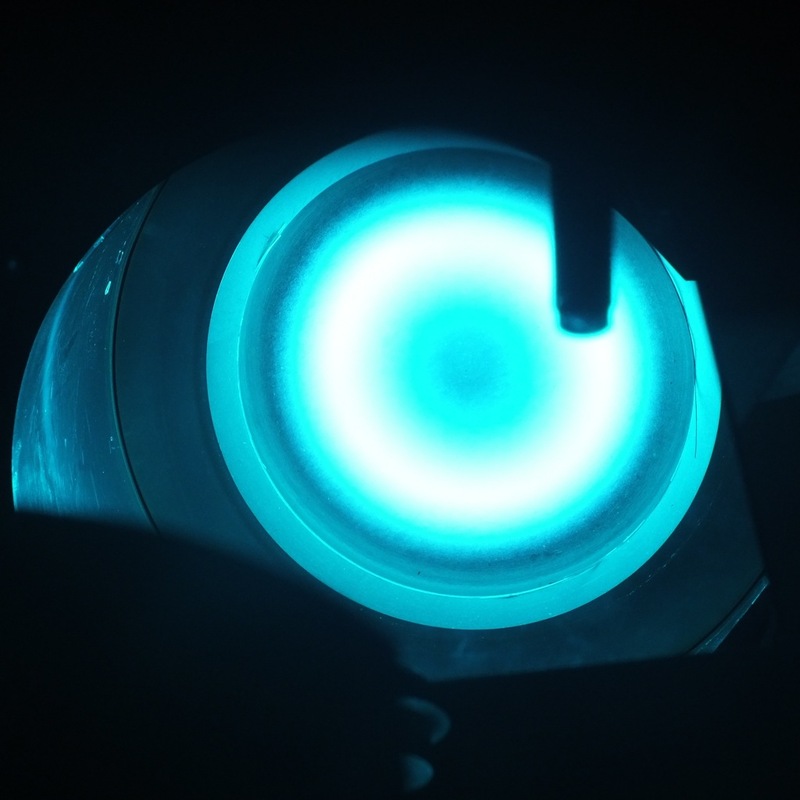 The glow above the magnetron is the plasma trapped by magnetic fields near the target, while the faint plume extending upwards is caused by excited, glowing silver atoms. 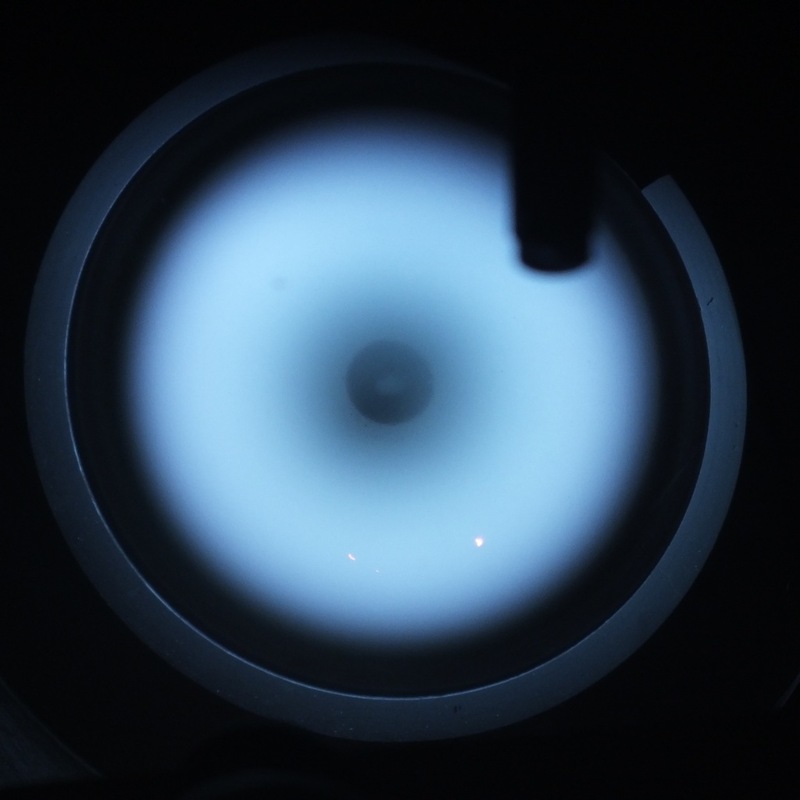 Unlike the e-gun, the magnetron turns on and off instantly, so the shutter (seen to the right) is only used to prevent contamination of the silver target when the magnetron is not in use. (right) We have since added "collars" of thin stainless steel around each magnetron, to confine the deposited material to a narrower angle. This photo shows an early test with a collar about 0.5-inches high, but the actual collars are now about 4-inches high with a cut-out for the shutter (the open shutter acts as part of the collar).